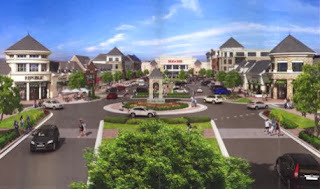 Conceptual rendering submitted by Fuqua. Last Tuesday evening Post 1 city councilman Phil Sadd hosted a townhall meeting at Winters Chapel UMC. The agenda included such topics as the new trash plan, code enforcement and the upcoming votes on SPLOST renewal and Redevelopment Powers. But the most contentious subject was the inclusion of apartments in the proposed 'town center' development across from the Forum, and the mayor's apparent reversal on the subject. Several residents angrily pointed out that after opposing apartments earlier this year, he now claims to be open to the idea "if it is in the best interest of the city". The city recently selected Fuqua Development as their choice to develop the former 'Robert's property'. Fuqua's selection was based in part on their conceptual rendering of the property and their ability to complete a project of this size. At issue is the part of their proposal that includes 356 apartments, in light of the fact that the main reason cited by the city for originally buying the land was to prevent the construction of 267 apartments by Lennar Corp. The city has been quick to point out that a final development plan has not been approved. According to city officials there will be some 'negotiations' with Fuqua prior to the sale of the property, and that the planning commission and city council will have to approve final site plans before any construction permits are issued. Recall last January when the city was trying to buy this property from Lennar. In an editorial in the Patch, Mayor Mason defended the city's actions by saying that the idea "that the apartment plans will have to be reviewed by the Planning Commission and will ultimately need the City Council’s approval to proceed... is just not true. If the plans meet the building and zoning code requirements, the city will be obligated to issue a development permit. We don’t have the ability to reject a permit application if all the codes have been met." Here is where the mayor's comment about 'the best interest of the city' becomes important. Once Fuqua owns the land, they can build up to 659 apartments and still be within the building and zoning code requirements. The explanation we will hear will be that it is in the best interest of the city to not deny construction permits and be dragged into a lawsuit that we cannot win. Instead of trying to create a town center out of thin air, do it somewhere that already has some elements present. Technology Park already has office space and a job base, a couple of hotels, some condos and multiple access points from Peachtree Industrial Blvd, 141 and Spalding Drive that can handle the traffic. Let the city buy one of the buildings near one of the lakes and tear it down to make a 'town green' space. Change the zoning to allow some of the empty buildings to be re-purposed for retail, or even unique living spaces. After all, wasn't keeping Norcross from annexing Technology Park one of the main reasons for incorporating a few years ago? As for the Robert's property, turn it into a passive park. Walking/ jogging trails, bike trails, green space, maybe some picnic tables...no ball fields or dog parks, just a peaceful oasis in the middle of town. Use the expected windfall from the SPLOST to pay for it. This city is already running a surplus, the council doesn't need a $20 million slush fund. To Tad or Not to TAD - What are Tax Allocation Districts and Should Peachtree Corners Make Use of Them? Last week Patch reported on the city's plans to seek redevelopment powers in order to stimulate development in the Holcomb Bridge Rd corridor. Much of the article centered on the proposed use of TADs (Tax Allocation Districts) to accomplish redevelopment goals, but didnt go into much detail about what a TAD is and how it works. Hopefully some of the following information will be helpful. Tax Allocation Districts are sometimes called TIFs (Tax Increment Financing) because they are based upon the incremental increase in tax revenues. Basically, the city designates an area as blighted, or economically underdeveloped. It then issues bonds to raise money specifically for making improvements within the TAD. These improvements are usually in the form of infrastructure- roads, sidewalks, sewers, stormwater drainage and even public transportation. The public improvements the city makes coupled with the private redevelopment it (hopefully) spurs cause property values in the TAD to rise. As the property values rise, so does the amount of money those properties pay in property tax. That increase in the amount of taxes paid is put in a special account and used to pay off the bonds. Although TADs have been in use for years, the jury is still out as to how well they work. Many point to Atlantic Station as a great example of a TAD at work. The site of the former Atlantic Steel plant was designated as a brownfield; the old steel plant was an eyesore and the land around it was polluted from the fallout of years steel production. In 1999 the assessed value of the property was $7 million. The City of Atlanta floated $67.5 million worth of TAD bonds to help pay for nearly $190 million in cleanup and infrastructure improvements to the site. By 2008 the assessed value of the property was $452 million and it was generating an incremental increase in tax revenues of $8.3 million per year to the City of Atlanta- more than enough to pay off the bonds in thirty years. But since then, the economy at large has been in recession. Stores and restaurants at Atlantic Station have closed, condos have gone unsold and apartments have become vacant. The area has developed (no pun intended) a reputation for cruising and crime. A real estate professional and resident of Atlantic Station likened it's downward spiral to Underground Atlanta. The accompanying drop in property values has reduced the amount of 'incremental increase' in taxes to the city. Time will ultimately tell if it is successful. A TAD to redevelop residential areas near 'the square' in Marietta is facing similar difficulties. As a result of the recession, several of the developers involved have gone bankrupt leaving some of the area undeveloped. Those who bought 'early' have seen their home values decline and the city has seen tax revenues decrease, although not enough yet to put the TAD bonds at risk. As with Atlantic Station, time will tell if the TAD is successful. Sometimes there are other municipal costs associated with a TADs that are not covered by the increase in tax revenues. The increased development may create an increased need for services like police and fire. Since the funds generated by the TAD are earmarked to pay the bonds, the increase in the cost of services is borne by the city. What happens if the TAD doesnt live up to expectations? The AJC reported a couple of years ago that the taxpayers of Kansas City were stuck for $6 million in 1999 for a TAD gone bad. In Georgia, the laws regarding the use of TADs are much stricter. Cities are not allowed to pledge general revenues to back the bonds. The investors who buy the bonds bear the loss if the bonds default. John Matthews, a professor of policy and planning at Georgia Tech has studied and written extensively about TADs. In the event of a default he believes that "bond ratings could suffer and interest rates rise" on future bond issuances, and he says that cities are seen as having a "moral" duty to guarantee the bonds. Unanswered as yet is what Peachtree Corners would do with a TAD given that the municipal contribution to the TAD is infrastructure improvement. As a limited services city, Peachtree Corners cant build roads, sidewalks or sewers and cant run buses or trolleys. 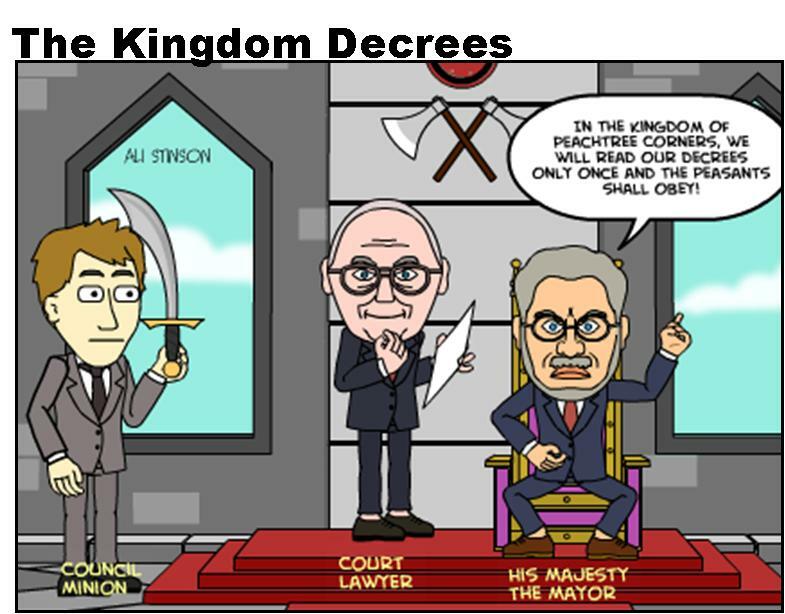 Does the Redevelopment Powers Act give them these powers? The mayor claims that it does not. Is Holcomb Bridge Road blighted or economically underdeveloped? I think most would agree that portions of it are unsightly, mostly as a result of haphazard zoning and a diverse collection of architectural styles, but not blighted. Perhaps a CID independent of the city would be better suited to the city's purposes. The city of Peachtree Corners is designated as a very unique form of government - a city-lite. This is because the city is charted by the state legislature to provide just three services - 1. Planning and Zoning 2. code Enforcement 3. Trash Collection. The city has not even been functioning a year and only one of the 3 services is completely operational. 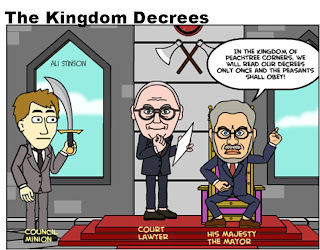 Yet the council and mayor are already looking to expand their powers. Tonight's city council meeting has two items on it that attempt to do just that. 1. The council is looking to pass an ordinance removing the second read requirement to pass ordinances in the future. This is a problem because it gives us, the citizens, no time to react to the proposed law before the council can vote it into being. They argue that this is holding up businesses who need zoning changes and that the second read is really moot because they could hold back to back meetings to meet the second read requirement. We are OK with the idea of changing the second read requirement on business zoning issues that have already passed the zoning commission vetting process. We do not want the council's powers expanded to pass any ordinance this way. They may circumvent the requirement by holding the back to back meetings, but then we would at least be alerted to the fact they are up to no good and trying to block citizen input. We want the ordinance eliminating the second read to have tighter, more limiting language. 2. The council wants to expand the charter to allow them to provide a 4th service. The resolution reads "A Resolution of the Mayor and Council of Peachtree Corners, Georgia requesting the local legislative delegation of Peachtree Corners, Georgia to introduce a local law authorizing Peachtree Corners, Georgia to have redevelopment powers pursuant to the redevelopment powers law; and for other purposes." It appears they will put this on the ballot for a November referendum. We believe they are already breaking their promises to keep this a city-lite with this expansion of powers. We think they should get the other 3 services implemented and running smoothly before they try to convince us they deserve more power and more money to spend. Add this to the elimination of the second read in item 1 above and you have recipe for all sorts of abuse without the citizens able to react or voice their objections before the council buys land, builds infrastructure or otherwise spends tax money the way they want. A recent announcement of plans to build apartments on the Roberts property across from the Forum has stirred up quite a controversy in Peachtree Corners. Commenters on a recent Patch article expressed concerns ranging from worry about the effects such a development would have on traffic, to overcrowding at Simpson Elementary and Norcross High schools, to negative effects on property values. Whatever their reason, all seemed to agree that they don't want to see apartments built on that parcel of land. Based on the mayor's statement a couple of weeks ago, he and the council are as opposed to apartments in that location as everybody else. Lennar Homes out of Miami is currently planning to close on the property on Feb. 7th and expects to break ground this spring. As long as they meet the zoning requirements and building codes, the city is powerless to stop them. Any attempt by the city to deny building permits or otherwise stop the project would likely result in a costly lawsuit that the city would lose. Unfortunately that leaves the city few options: do nothing and allow the development to proceed as planned (which nobody wants); or buy the property and hope to sell it to someone who will develop it in a manner more to the city's liking (which opens up a whole new can of worms). Given that Lennar already has a contract to buy the land on Feb. 7th, it's too late for the city to buy the property directly from Charlie Roberts. That means the city would have to buy the land from Lennar before they begin construction. Lennar is spending a reported $7.6 million to buy the property. Obviously, they expect to make a profit from the development or they wouldn't be doing it. That suggests it would cost the city a sum greater than $7.6 million to get Lennar to part with the property. So the main question to the residents of Peachtree Corners is, are you in favor of the city spending $10 million, $12 million or more to buy this piece of land in order to prevent apartments from being built on it? As I said, buying the property opens up a can of worms. While the charter gives the city power to purchase property, does it permit the city to purchase land for this purpose? Keeping in mind that it could be several years before a suitable buyer is found, are you comfortable that a future mayor and council would follow through on the plan, or do you worry that they could use the land for another purpose (like building a city hall)? Are you comfortable with the possibility of the city someday having to sell the property at a loss? Knowing it would require the city to continue levying property taxes at or near the (one mil) limit, are you comfortable with the city assuming such a large long term debt barely halfway through its first year in operation?How much would you be willing for the city to spend? And lastly, what kind of precedent would it set? In the future, will some other property owner propose to redevelop his property in an unpopular manner in the hopes that a public outcry might prompt the city to buy him out? Do the real and perceived benefits of not having apartments there outweigh those concerns and others? Call and write soon. February 7th is next week. The City Council holds council meetings the third Tuesday evening at 7:00 PM each month. Please consider attending as many as possible. Check the City Website for information. 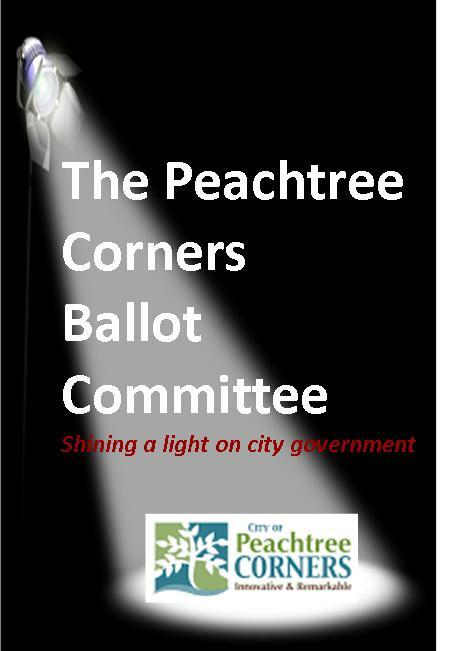 We are an all volunteer group of concerned citizens in Peachtree Corners. We are committed to watching over the new city government and ensuring it is something truly unique in government - forever inexpensive and unobtrusive to its citizens. We intend to hold all city officials to the promises of a City-lite government.